Peterhead lies 29 miles north of Aberdeen on the picturesque River Ugie. Collieburn lies between Waterside Road and the Collie Burn. To the north of the site lies Scotia’s Inverugie Meadows development. The site benefits from great pedestrian and vehicular connections to the wider surroundings. 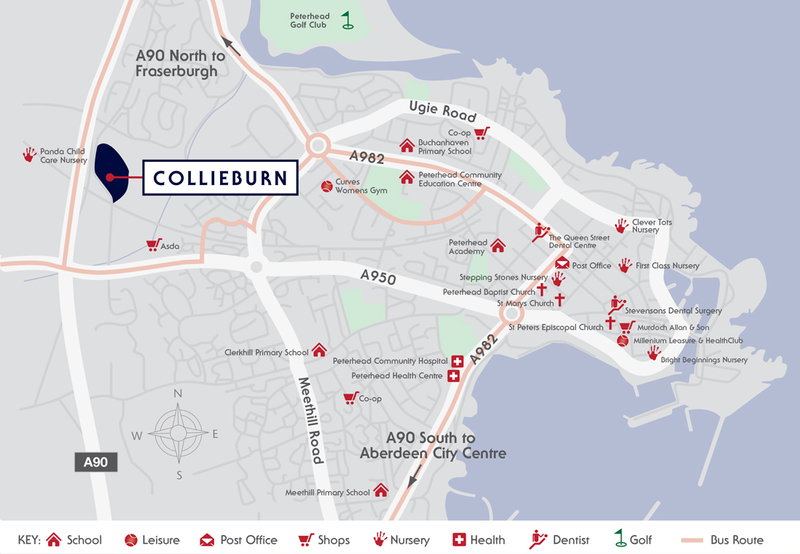 A network of footpaths allow pedestrians to get around the site with ease, while bus stops along Waterside Road link Collieburn to the wider town centre and beyond. Aberdeen city centre can be reached in approximately 40 minutes by road and the business centres at Bridge of Don and Dyce on the north side of the city, are within close proximity, as is the University of Aberdeen. The fishing town of Fraserburgh to the north, is just a 20 minute drive.